Hartford, CT - Bring a picnic dinner and enjoy the lively music of the Hartford Steel Symphony on Thursday, August 9th in the Butler-McCook Garden! The Hartford Steel Symphony will be playing a mix of Soca, Calypso, Reggae, Pop, Classical, Gospel and Jazz, all with an island rhythm. The Sunset Sounds Concert Series takes place on the 2nd Thursday of the month, June through September, from 6 to 7:30 pm on the Richard P. Garmany Fund Music & Education Terrace (made possible by Hartford Foundation for Public Giving) at the Amos Bull House. Free tours of the first floor of the Butler-McCook House will be offered at 5:30 pm; donations welcome. Step inside the Amos Bull House and the Butler-McCook’s Aetna Gallery to view Edith Skiba LaMonica’s Garden Treasures exhibition, which celebrates gardens that are the source of food for both our body and our spirit. Inspired by the light and color of impressionism and the techniques of expressionism, Edith’s flower and still life portraits commemorate the art of nature’s treasures. The exhibition will be open to the public during regular operating hours from August 10th through September 9th. For more information, visit http://edithskibafineart.com. All concerts are FREE and open to the community. The event is supported in part by the Hartford Courant Media Group; the Richard P. Garmany Fund at Hartford Foundation for Public Giving; the Greater Hartford Arts Council’s United Arts Campaign with major support from the Hartford Foundation for Public Giving; & the Evelyn W. Preston Memorial Trust Fund, Bank of America, N.A., Trustee. The series will conclude on Thursday, September 13th with folk rock quartet Among the Acres. The Hartford-based group fuses an eclectic range of influences into a sound defined by cascading vocal harmonies, intricate string melodies and an insatiable desire for “groove”. The Amos Bull & Butler McCook galleries will feature John Hsu’s Images in Water exhibition, which celebrates water reflection composition. The Butler-McCook House & Garden and Main Street History Center is located at 396 Main Street, in Hartford. It is open for tours May through December. For hours and more information, visit www.ctlandmarks.org; www.facebook.com/pages/Butler-Mc-Cook-House-Garden; or call (860) 247-8996 x 12. Established in 1989, the Hartford Steel Symphony, under the musical direction of Kelvin Griffith, provides musical enjoyment in and around New England. The band and its members continually finish at the top of competitions. They have performed with musical tycoons such as The Hartford Symphony Orchestra and one of Steel bands’ greatest pianists, Len 'Boogsie' Sharp. The Steel Symphony contributes to community entertainment in statewide parades and events such as Hartford’s First Night, UCONN’s championship recognition parades, and town music festivals. 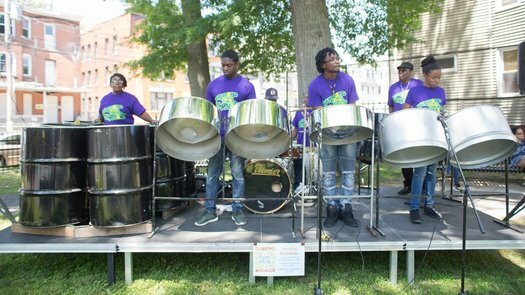 Keeping with their historical roots, the Hartford Steel Symphony proudly participates in the annual Taste of Culture and various West Indian Celebrations in the summer months. Edith Skiba LaMonica has an M.A. in Art History from New York State University at Stony Brook. She taught Studio Art, Design, and Art History at SUNY Empire State College, Suffolk Community College NY, and the College of New Jersey. Represented by the ARTWORKS Gallery of the Philadelphia Museum of Art, her paintings are part of private and public collections such as The Univ. of Pennsylvania Hospital. She has been featured in publications, including: Newsday NY, The Philadelphia Inquirer and “In the Spotlight” of the New Britain Museum of American Art Bulletin. She is member of the UCONN Health Arts Advisory Committee and The Canton Artist’s Guild.